The objective of this work is to allow managing and producing a video content from SMIL presentations. This is ideal for clients who can play only video and do not support SMIL. Another objective is to use the SMIL description to enable the generation of video content with added TV-based effects like: subtitling, TV and TV programs logo insertion, automatic languages translations, publicity effects, film credits, etc. The use of the SMIL language enables the adaptability of the video content for different contexts. Consequently, from one SMIL presentation many videos can be generated for different preferences and capabilities: languages, content filtering, etc. In the following, we give an example of video generation from the SMIL specification. The corresponding temporal presentation is given by the following graph. 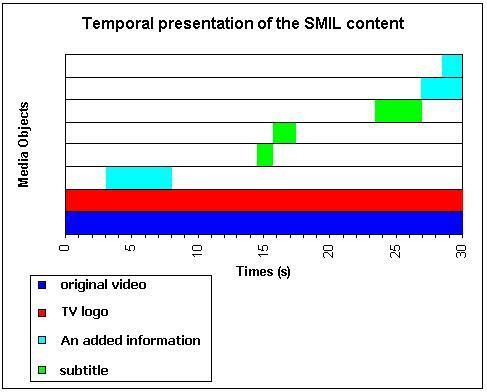 As we can see, the SMIL specification given above indicates that the final presentation should include permanently a tv logo during all the whole video playing. A subtitling of the video is also described and other information are added. Here are some screen shots from the generated video based on the SMIL specification. As it is specified by the SMIL scenario, the logo (LogoTV.gif) is displayed in the same time as the original video and has the same duration (30 seconds) as the video.